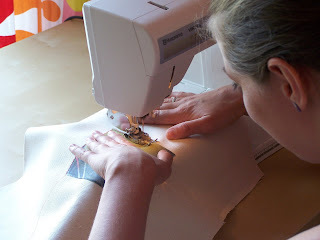 I held a sewing workshop with friend and fellow Boston Handmader Lucie of Lucie Wicker Photography. She's a talented photographer and is well known for her shots of our local baseball team the Boston Red Sox "Go Sox"! She wanted to transform these prints onto a bag that she could make instead of buying and I knew with my expertise in that department I could help. Our day began with a pick up at the train station and then heading to Joann's for materials. 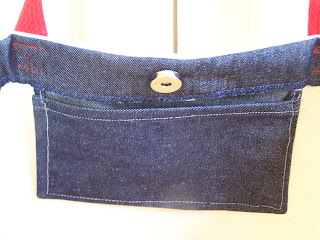 We bought this denim fabric that looked like off white canvas just as durable, blue denim for the pocket and any other accents for the bag, interface, matching thread of the Sox's, magnetic snaps, hooks, pre-made cloth straps, and needles (see above photo). We had to stop at Friendly's on the way back to my house for some watermelon ice cream that Lucie loves and hasn't had in awhile since there's no Friendly's in the North End of Boston. Lucie told me the dimension she would like for the tote bag and I brought out my kraft paper, pencil, rulers, and scissor. 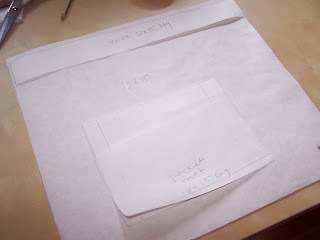 We then made templates to use to cut out for the bag, it's pocket, and liner/interface (see photo above). 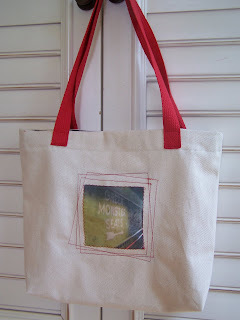 Lucie pre-printed the her photos on fabric paper so then we cut them out and glued it onto the front of the bag. 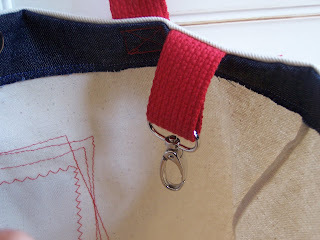 We then made some decorative stitching to keep the photo attached to the bag and then some more fancy stitching around the photo in the Sox red color. 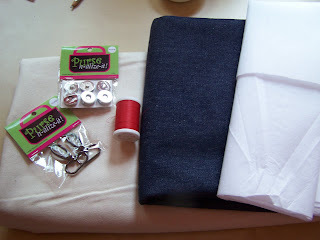 From there I showed her how to sew up the bag, add the handles, liner, hook (for your keys), and a magnetic snap. She did an excellent job using my sewing machine for the first time and the bag came out pretty amazing. Soon Lucie will have this bag and other designs available on her Etsy shop and shows. Here are some extra shots of the pocket with the magnetic snap and hook.